Phoenix Sky Harbor International Airport is the largest airport in Arizona. It is located right in downtown Phoenix, making it very convenient to get to all the cities of the greater Phoenix area, including Tempe, Mesa, Scottsdale and other cities and towns. It is also very close to the Phoenix Convention Center, Chase Field (home of the Arizona Diamondbacks) and the Talking Stick Resort Arena, formerly known as US Airways Center (home of the Phoenix Suns). This major airport is one of the easiest to navigate in your car, from a signage perspective. The airport is modern, with light and large spaces. It is pleasant to walk around, and it is clean. Phoenix Sky Harbor International Airport prides itself on its Museum and Art Program. If you have time to spare, you can see wonderful art exhibits. There are permanent collections as well as changing exhibits. There are three terminals—ranging from Terminal 2 to Terminal 4. Luckily getting from terminal to terminal doesn't take forever. Ten minutes usually does the trick. There are neat shops and dining options at Phoenix Sky Harbor International Airport at Terminals 3 and 4 and new places are opening up all the time as Terminal 4 continues it's modernization project. Businesses here generally don't overcharge for their merchandise or food, as happens at some other airports. Baggage Claim has an easy-to-read display that shows where you bags will arrive. No more strategic positioning to pounce on a carousel when the flight number pops up! It can take a while to for your bags to arrive though. The Phoenix airport was the first to install an innovative paging system, doing away with those white paging phones. Messages may be sent in a variety of ways including a touch screen, Braille enhanced keyboard, a telephone handset or headset, or an EZ access device for those with limited hand mobility. Instructions are available in English, Spanish or German. The names of those being paged are both announced through speakers inside the terminal and displayed on monitors throughout the airport. The PHX Sky Train helps travelers get around the airport, free of charge. The Sky Train also connects to the METRO Light Rail service. The are nearly 150 Assistance Call Boxes in parking lots at Phoenix Sky Harbor. Now if you have a flat tire, or can't get into your car, or can't even find your car, help is just a call away. Sky Harbor Airport now has short term (less than four hours) parking. There's also a Cell Phone Lot for those who are waiting for an arrival, but don't want to park. Free Wi-Fi is now available in all three terminals in the passenger areas, near the gates, shops and restaurants. If you lose something at the airport, don't worry! Try the Sky Harbor Lost & Found. Sky Harbor is dog-friendly and even has two dog exercise areas in Terminals 3 and 4! If you need to exchange foreign currency, all the exchange counters are in Terminal 4. The City of Phoenix bought the airport for $100,000 in 1935. In 2005 over 41 million passengers were processed at Sky Harbor. Terminal 4 is the busiest—32.3 million passengers flew in and out of Terminal 4 in 2005. That terminal, where US Airways and Southwest have their gates, handles about 75% of the passenger traffic. In January 2006, Phoenix Sky Harbor International Airport was ranked the 7th busiest in the country for passengers and the 8th busiest in the nation and the world for operations (takeoffs and landings). Phoenix Sky Harbor International Airport had more than 42 million passengers in 2007. It was a new record. New passenger records have been set every year since 2003. Sky Harbor was the eighth-busiest airport in the nation in 2007, according to a Federal Aviation Administration's ranking. 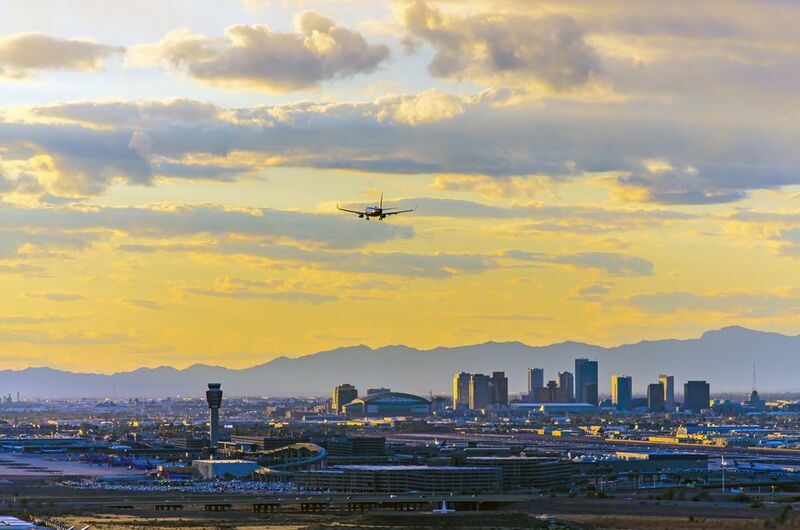 Each day, there are approximately 1,600 take-offs and landings at Sky Harbor, including commercial, general aviation, military and cargo flights. The airport itself takes up 3,000 acres. There are 3 terminals with over 100 gates. They are Terminals 2, 3 and 4. Terminal 1 was finished in 1952 and was the only terminal until 1962. By the time the 1980's came around, air traffic in Phoenix had increased dramatically and instead of performing major renovations to the terminal, Terminal 4 was built. Terminal 1 closed in the early 1990s, and the decision was made not to renumber the other terminals because passengers had memorized which airlines were served out of each terminal. The average number of passengers at Sky Harbor is more than 100,000 every day. An additional 125,000 people come to the airport each day, including employees, passengers' friends, families and drivers. The City of Phoenix Aviation Department employs 750 people and there are over 31,000 employees who work at Phoenix Sky Harbor Airport. More than 300,000 total jobs are supported by the Phoenix airport system with an annual payroll of 10.3 billion (2005). The Phoenix Airport System, including Sky Harbor, Deer Valley and Goodyear Airports, is the largest economic engine in the State of Arizona, providing a total economic impact of $56 million per day and $20.4 billion per year.